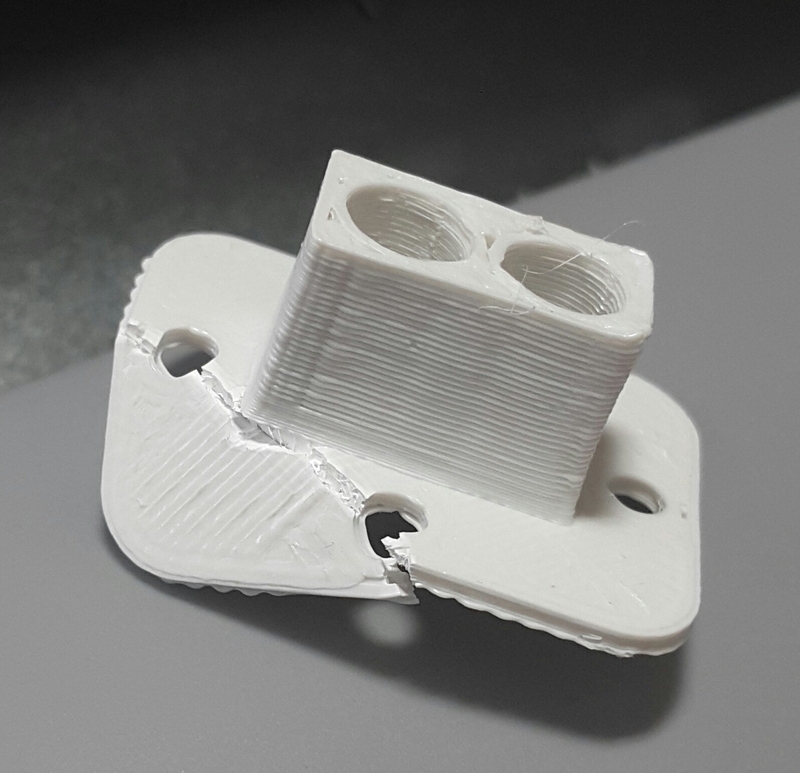 Could you tell me what's wrong with my design or is it my printing service who screwed up ? I don't see any issue with your OpenSCAD model. The walls arround the LED and LDR lodging seems a bit scarce. The joint between the block and the plate is certainly the area of greatest stress. You might add some fillet there. > who screwed up ? > service who screwed up ? the nightly builds, I can see no issues at all in Blender. 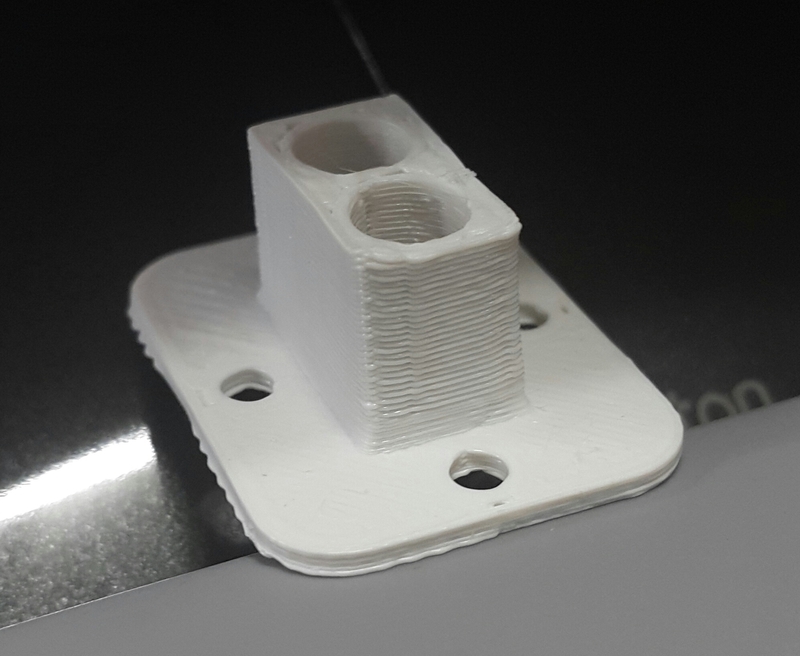 If it was a home style FDM printer (perhaps via 3DHubs etc) and they didn't have the temperatures dialed-in, layer separation could easily occur. If it was in ABS a dip in acetone can help a bit with bonding. the alu around the plastic to keep anything entering from the sides . Thanks to all for the generous comments. This picture clearly shows that there is no binding at all between the plate and the block. These parts are totally useless. Ronaldo: You are right. Too thin and no filet. My problem is that I don't know anything about printers capabilities and properties and don't know what to avoid when constructing. Everything looks so good on Openscad. Next time, before printing, I will share my project on this list for the community's comments. jon_bondy : I printed through "3D Hub" and the printer advertises an "UP mini" (? ), black ABS. I paid $4.80 for 10 units, plus $5 setup (printed in Switzerland. As I am learning, I selected the cheapest(...), nearest printer). (previous upload was the wrong project file. Sorry). MichaelAtOz : FDM printer ? I don't know. Yes, "3D Hub". Thanks for the acetone tip. arhi : Fairly strong ? You must have a better printer than the "UP mini" used. (Off subject. Sorry) Thanks for the tips in building the sensor. 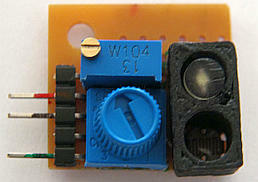 I use a white LED and a flat Light Dependent Resistor. The latter is buried deep to avoid catching stray light. Not being able to use my print, I came up with this. The two var. res. allow me to adjust the brightness and the divider, to adapt the readings to various ambiant lightings. I'll try your solution using IR though. Lastly, if anyone knows of a good resource for a newbie to learn about 3D printer capabilities and materials, I'd appreciate the link. Also, I find filleting difficult to do. Any recommendation/tip or good lib. on the subject ? > These picture clearly shows that there is no binding at all between the plate and the block. more important issue here is I'd say they are not using original UP! hacking the PT100 sensor by adding a resistor in series) as original UP! your design error, it's purely fault of the print house. > /arhi/ : Fairly strong ? You must have a better printer than the "UP mini"
> printer capabilities and materials, I'd appreciate the link. a module I call "weld" which joins two parts but with a fillet (so it looks like they were welded). Thanks or all the trouble making these test parts arhi. It's surprising that you could break the plate without the block coming apart ! Besides the fact that my design is flawed (no fillet, too thin walls, etc. ), your prints demonstrate (I think) that my printer did not set the right temperature. I'll submit my new design to him before printing. I'll order one only test unit before printing a bunch. I will redesign my housing using the weld() module submitted by osj1961 (see his post in this thread). As for the off-topic subject on the use of LED/LDR for my sensor, I agree with you a 100% on the flat LDR subject. I'll go infrared as you suggested. MAGICAL ! Thanks for this osj1961 ! I was working on the tedious task of filleting by differencing cylinders from cubes when you wrote. At present I am far from understanding the mechanics of your module but will chew on it soon. To quicken generation, I change union() to weld() at the end of designing stage. Wonderful. I think I am good to go but comments are welcome. Thanks again to all.